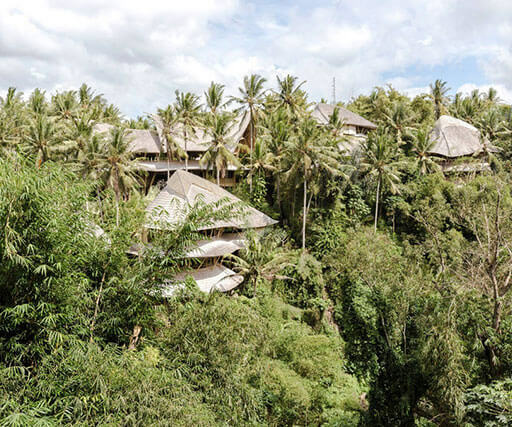 In the middle of the forest and settled next to the longest river on the Indonesian island of Bali, Green Village is a relaxing and secluded place which offers some stunning villas and bamboo treehouses. 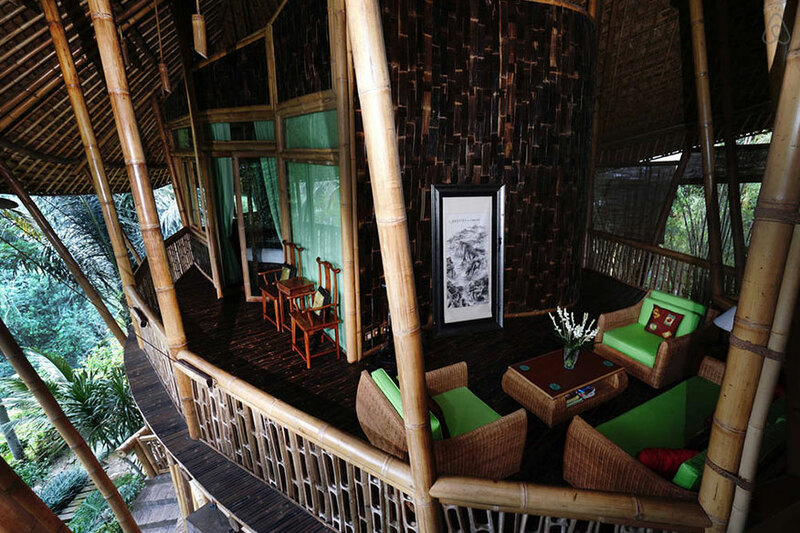 At the listing below you may take virtual tours of all bamboo treehouses and villas Green Village has to offer. Please click the reserve now button to see current availability, capacity, amenities and USD pricing. Green village has no smaller houses. All the houses are privately owned. The minimum stay policy is 2 nights. 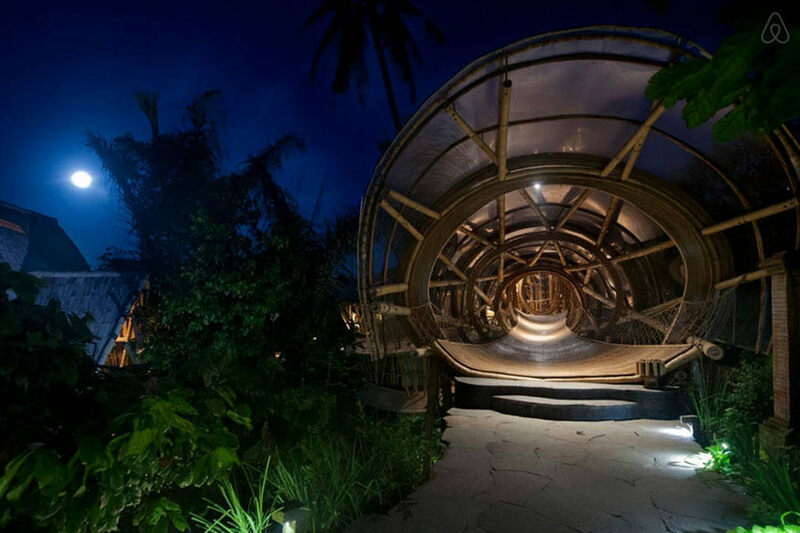 A multistory bamboo treehouse with an aura of luxury, a private garden with a guest house (1000 m2) and a private pool. All the bedrooms are fully air-conditioned. 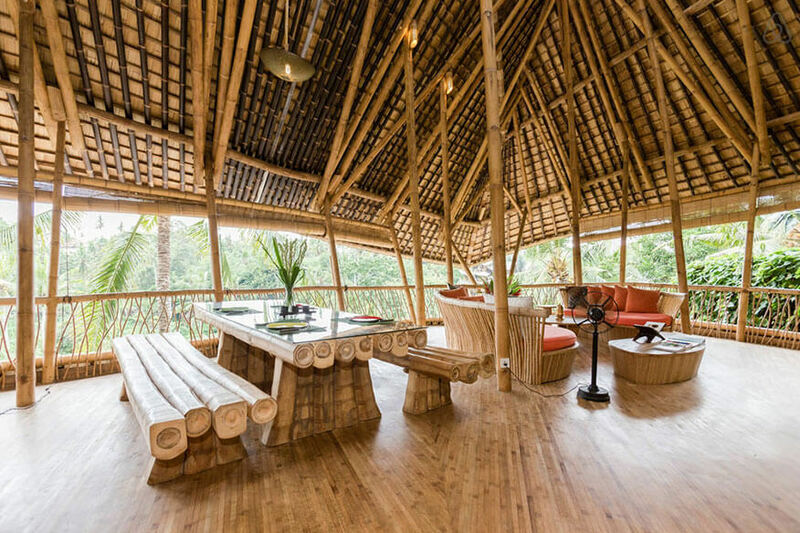 The unique bamboo design and luxurious interior bamboo treehouse has 3 levels to provide enough living space for up to 8 guests. 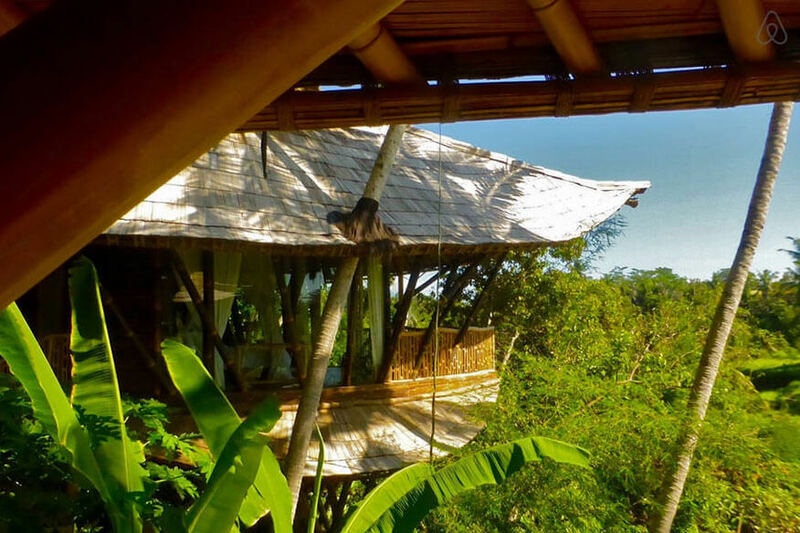 The extraordinary bamboo treehouse, called Palm Villa, has its own garden with a private pool and is settled right next to the Ayung River valley. The 4 floors home also comprise 3 bedrooms with its own bathroom and air condition, a spacious and fully equipped kitchen, an entertaining room with TV (international channels) and DVD Player, a dinning and lounge room. 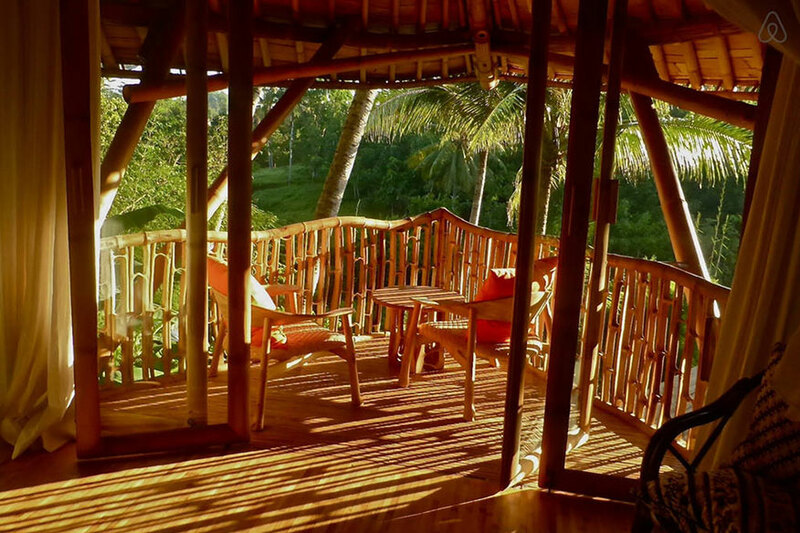 The luxurious pair of bamboo treehouses are settled at the top of the Ayung River and provides a stunning view over the whole landscape. The accommodation is ideal for a family vacation or two couples. 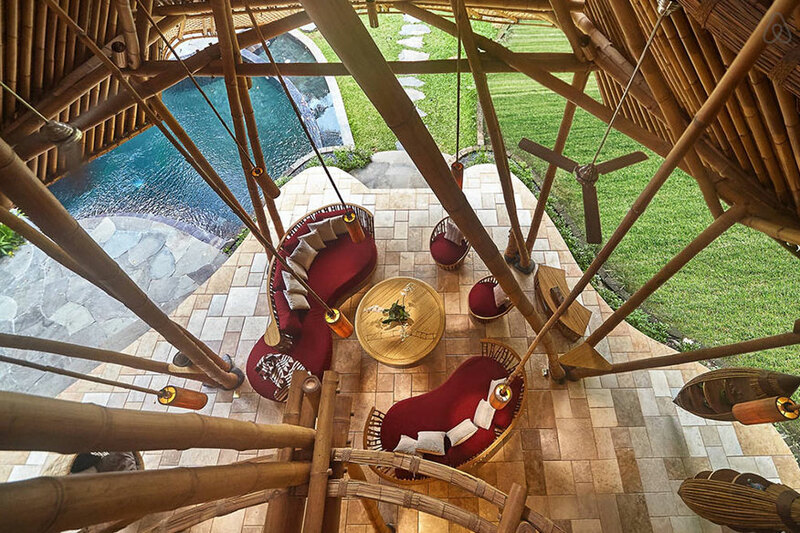 The two bamboo treehouses are set in a large garden with pool. Both houses have thatched roofs known as Pondoks which has a nice romantic flair. 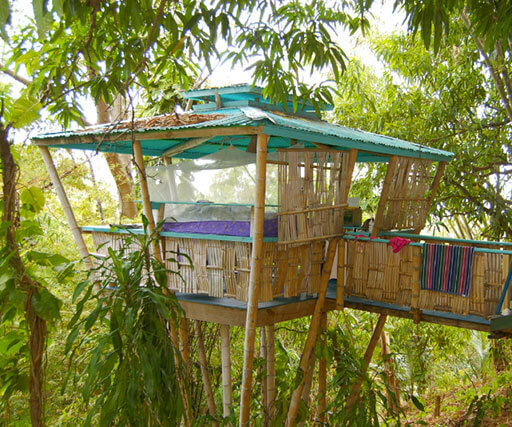 The bamboo treehouses have their own private bathrooms, AC, internet and are connected to the kitchen and lounge area. 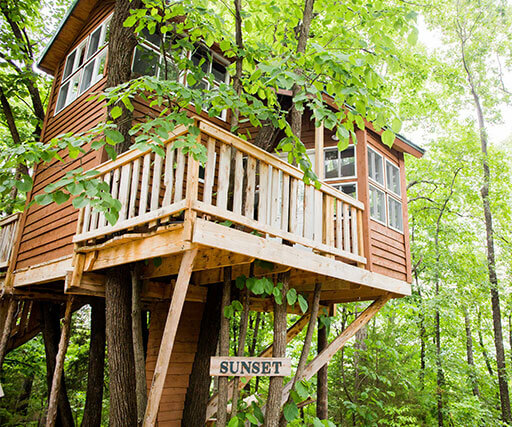 Selected as one of Airbnb’s top treehouses, Green Village’s Sunrise House attracts visitors from all over the world. 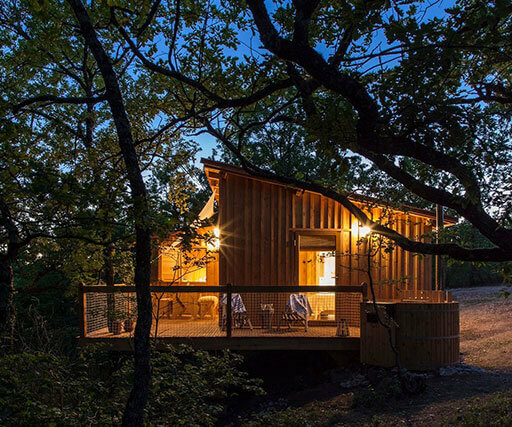 The four story treehouse comprises 3 huge bedrooms with its own bathroom, lounge area, dining space with stunning panorama view, work space, kitchen and pool. The Garden House at Green Village is ideal for a group of friends or a big family. The three-story villa is set in a private 1000m2 compound with its own garden, 3 bed- and bathrooms, extra bedroom for kids, guests area, huge natural pool, dining and lounge area and an open lounge at the top of the building. Not available during July and August. 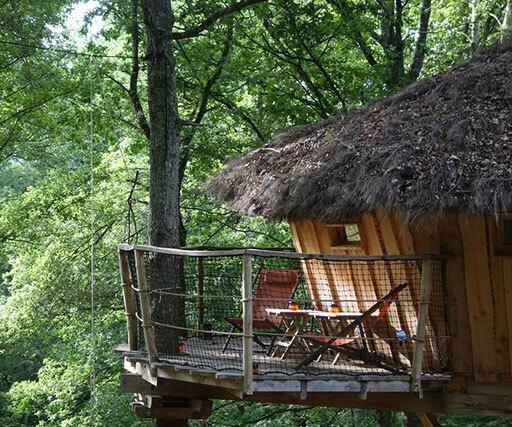 Sharma Springs is a remarkable bamboo treehouse and an architectural masterpiece. The five-story home is settled on the edge of the Ayung River and comprises 4 bedrooms with its own bathrooms, dining and lounge space with stunning views, kitchen, work space on the upper floor, play room for the kids, media room and a barbeque area in the garden. 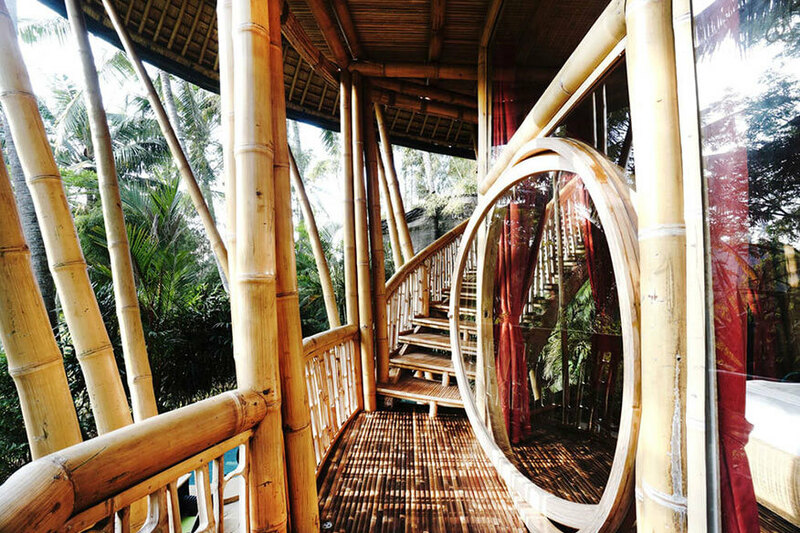 The main attraction of the treehouse is the entrance, which is a huge tube made out of bamboo. All of the bedrooms are indeed equipped with air conditioning. Available from June till December. 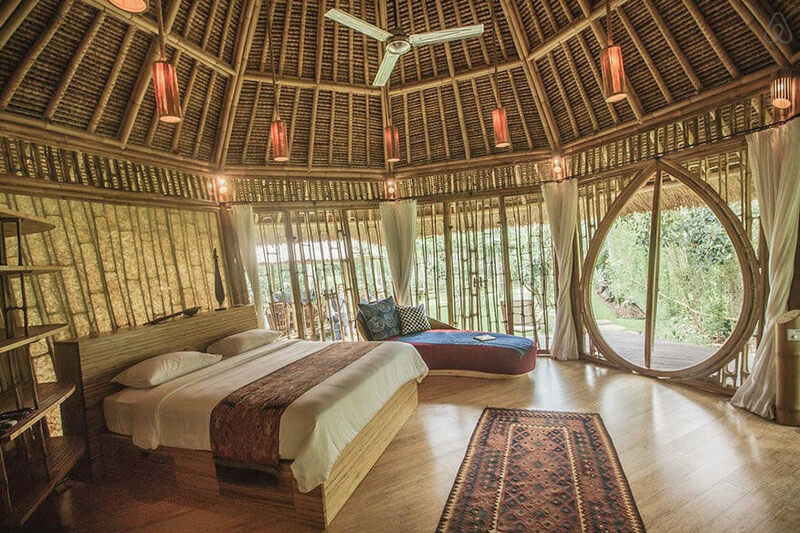 The newest multi-level bamboo treehouse, called Ananda House, makes you feel like you are in paradise with a little boutique flair. 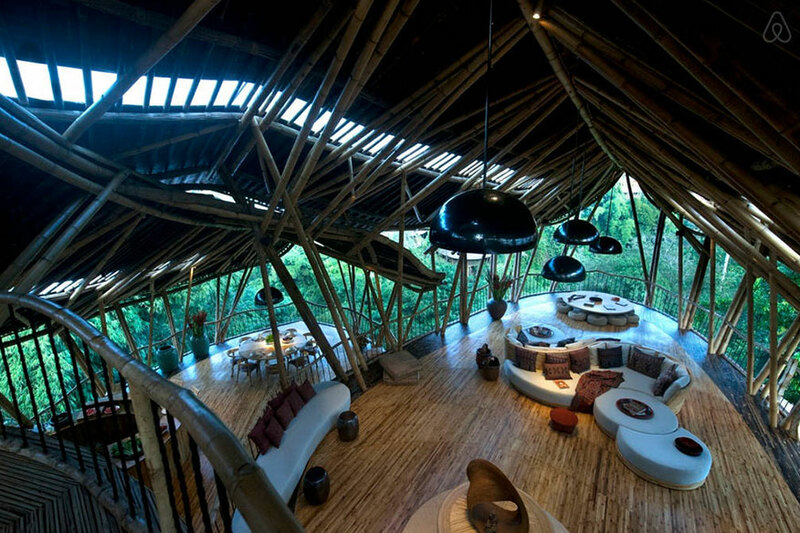 The home comprises three separate black and blonde bamboo treehouses. 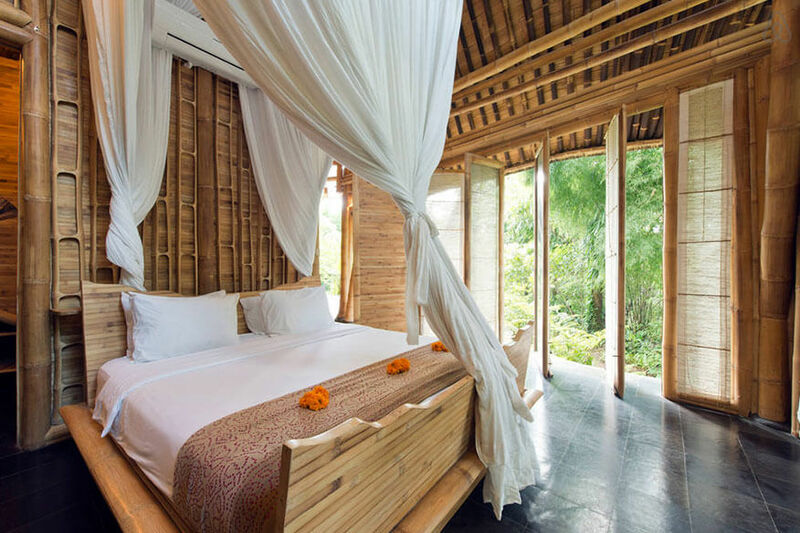 The master pavilion includes a king size bedroom with AC, terrace and indoor/outdoor bathroom with romantic stone bath. 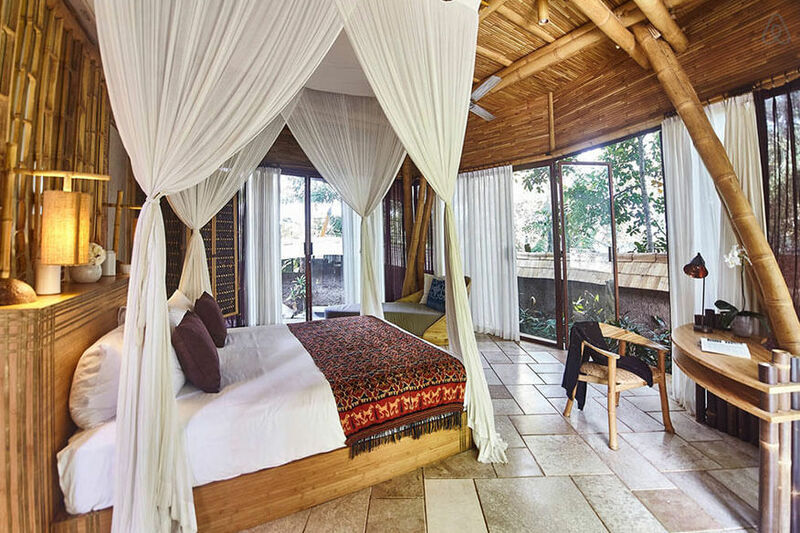 The guest pavilion has two suites with air conditioned double bedrooms, terrace with stunning view and indoor/outdoor bathrooms with rain forest showers. 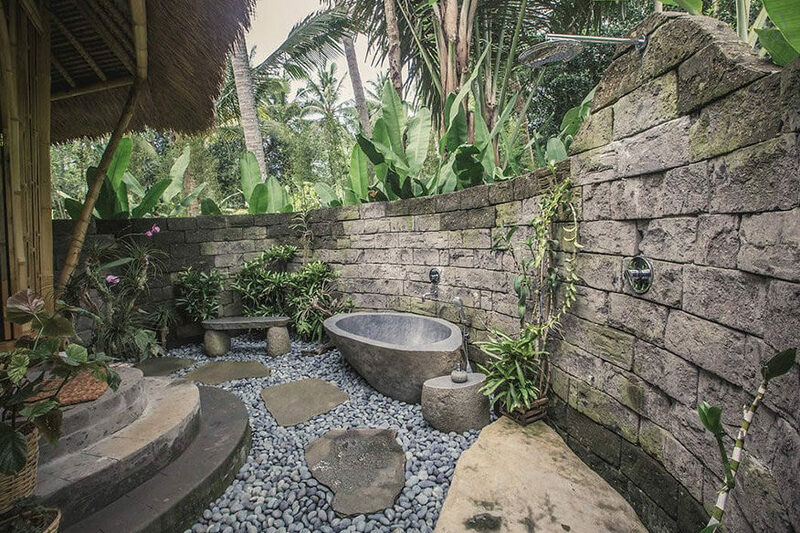 The bali living pavilion feels like a little garden and is the connection between the outdoor and indoor life. 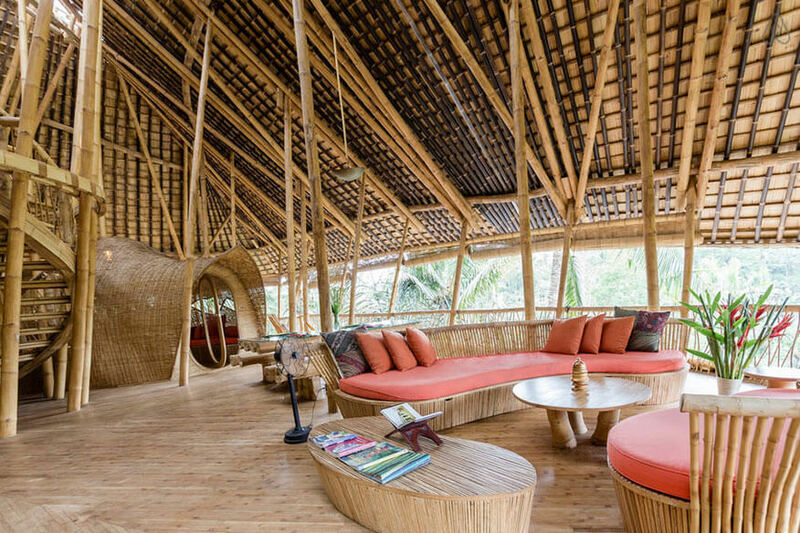 Daily housekeeping, drinking water, use of communal space including pool and the first morning’s breakfast is included with all bamboo treehouses, which all also have their own private pools. Green village has an on-site kitchen with a menu of home cooked meals. They can assist with Airport pick up for USD25 plus 21% tax and service per car. The accommodation is about 1 hour from the airport. If you wish to make a booking, please visit Airbnb (simply click on the reserve now button) and send your reservation request. 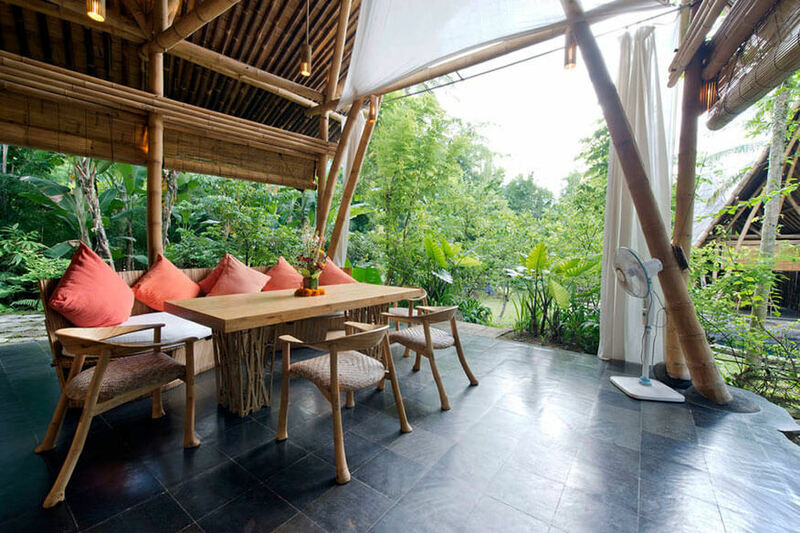 If for some reason, you are unable to make your booking via Airbnb, Green village can accept full advance payment by transfer to their bank in Indonesia, plus a 3% handling charge. Payment is not refundable. Green village cannot take credit cards over the internet.